I am one of those people that really enjoys most of Judd Apatow's projects, so choosing to see it in the theatre was a fairly sure bet for me. And like all Apatow's films, This Is 40 is spot on with keen insights, even if those insights and comedy behind them are of the raunch variety. Apatow is brilliant when it comes to making mundane, every day realities obscenely funny and it's no exception in This Is 40. However, the plot isn't anything particularly revolutionary and there isn't much of a solid storyline at all. It's more a patchwork of funny scenes threaded together with some tension and drama. It's like one of those long SNL digital shorts that doesn't really know how or when to stop, but you watch it anyway because even though it's long and drawn out, it's still entertaining. Yep. That's This Is 40 in a nutshell. If there's one strength in this movie, I'd say hands down it's the cast. Paul Rudd and Leslie Mann clearly have their comedic timing down and play incredibly well off one another. Rudd does his usual lovable/goofy humour and it works (as always) whereas Mann takes on most of the film's dramedy moments. Their veteran married couple banter is the reason to watch the film and it's those scenes that steal the show. Interestingly enough, Apatow and Mann's actual children play Mann and Rudd's kids in the movie. The girls, though sometimes stiff, had some surprisingly memorable moments and their sisterly banter felt very real (as I presume some of it was). Another thing to look out for are the amazing comedic cameos from Jason Segal, Melissa McCarthy and Chris O'Dowd. They provide the most laughs, by far. I guess my biggest issue with the film is that it stresses the financial woes of the couple as Pete's record studio is failing and Debbie deals with employee theft, but Apatow clearly has no realistic idea of what constitutes financial struggling for the average person. Pete and Debbie live in this grand, gorgeous house, they drive a BMW and Lexus respectively AND take lavish vacations to Mexico just because they can. Seriously, Judd? You're making middle class America really angry right now. But I won't even get too deep into this rant because that's not what the core of this film is about. It's about not taking life too seriously, acceptance and appreciation. But honestly, you watch this movie for the comedy more than you do for the life lessons. 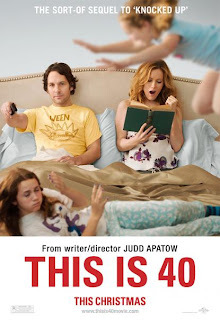 This Is 40 certainly isn't Apatow's best film, but it ranks better than average racy crap that's out there. And while it isn't quite as funny as, say, Bridesmaids, it's certainly one of the funnier movies I saw in 2012. Rudd and Mann reel it in and provide some much desired entertainment street cred, for sure. Overall, I liked This Is 40, though that's not to say I didn't have my issues with it. It's entertaining and downright funny while sometimes verging on clever. But this is one of those films you watch to laugh more than learn, and if you can be okay with that (and the random crude humour) then I think you'll enjoy it too. I want to see this for the cast (well, mainly Paul Rudd), but the idea that they're struggling financially sounds a bit silly. I didn't really like KNocked Up but I feel I may like this more. I thought this was better than Knocked Up, but maybe because I'm married now and there are a ton of marriage jokes in there. Paul Rudd is just too cute! Thanks for reviewing this. I have seen the trailer a whole bunch of times and I've been debating if I want to see it in theaters or wait till it comes out at Redbox. My husband has been asking me repeatedly to see it. I think maybe we will take the chance and see it in theaters for a good laugh. Plus, I feel like you can never go wrong with some Paul Rudd. You really can't go wrong with Paul Rudd, that's for sure! If you like a bit of raunchy humour, then I'd say give it a go in the theatre. It sounds entertaining and I do like both Paul Rudd and Leslie Mann. I hate it when the financial struggles are just plain silly in films and programs. Great post, this sounds worth watching. I liked Knocked Up. I liked this one better than Knocked Up (though both are pretty funny), so I'd check it out. Great review! I definitely have this on my To Watch list so it's good to hear that it delivers, flaws & all. This sounds like a perfect Saturday night movie - but I won't be best pleased with Lexus driver on his way to the airport for his Mexican vacation complaining about money issues LOL. Adding this one to my 'to watch' list! If you can set the pretention of it aside, it's HILARIOUS!